We haven't reached the Alaska Highway yet but we're 303 miles closer to it after today's drive. 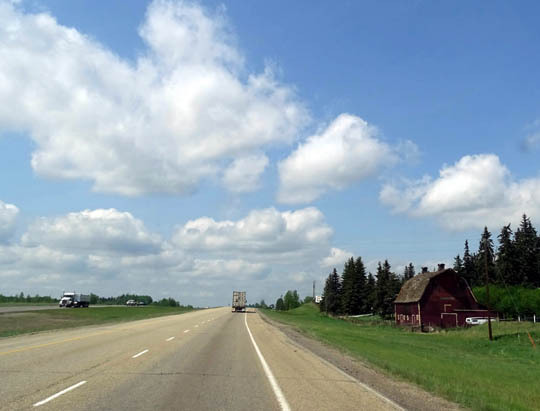 The weather was great -- warm, sunny, breezy -- and we had no problems traveling across more of Alberta. Mile 0 of the Alaska Hwy. starts a little west of the border with British Columbia; we'll get there tomorrow. 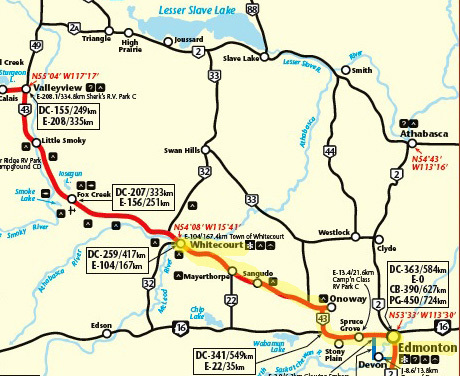 TODAY'S ROUTE: AB 2 through Calgary to the south side of Edmonton; AB 216 around the SW side of Edmonton at exit 537; CA 16 west to AB 43 to Whitecourt. 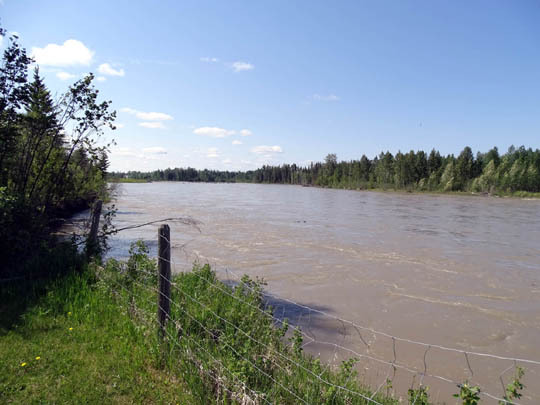 The GPS wanted to take us on two-lane roads on a shorter route NW from Red Deer but we didn't do it because we had no idea how good the roads are or if there might be some low bridges we couldn't clear. We would have encountered less metro traffic that way, though. ROAD CONDITIONS, TRAFFIC: Minimal construction and no bad traffic anywhere. Yay again! We waited until 9 AM to leave Walmart at the south end of Calgary since we had to drive all the way north through the city on a weekday. We didn't know about a newer Walmart at the north end of town at exit 282 that would have been a better option going NOBO on a weekday morning. 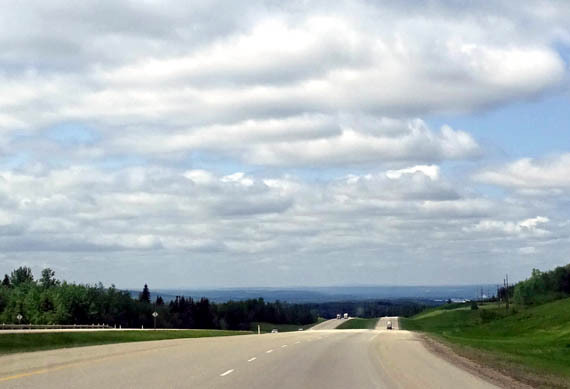 The freeway was mostly six lanes between Calgary and Edmonton, then four lanes the rest of the way to Whitecourt. Traffic was moderate there and lighter around the SW side of Edmonton. AB 43 had light traffic until we got to Whitecourt. It took us six hours (9 AM to 3 PM) with four short stops along the way, including a 10-minute wait for a train about a mile from our campground in Whitecourt. 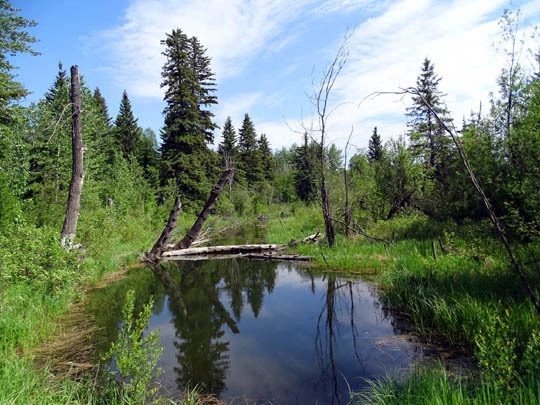 TERRAIN: Prairie morphed into more treed areas north of Red Deer. We could see dark green forested hills in the distance after that. There are lots of pines, aspens, and birch trees and more rolling terrain as we travel farther NW. We're seeing an increasing number of RVs as we drive northwest but most of them are going the other direction. 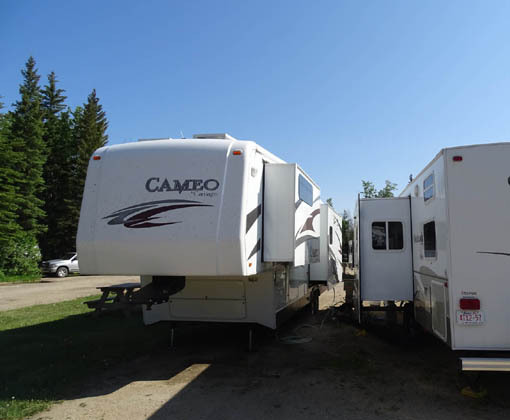 There are numerous RV dealers between Calgary and Edmonton, most with a lot of inventory crammed into the lots. I don't see how they can sell all of them this summer. Camping sure is popular in Alberta! Three years ago on our way north on this route we also spent the second night in Canada in Whitecourt. That time we stayed in the Walmart parking lot. This time we decided to stay at a real campground so we'd (hopefully) have a better public WiFi signal and could get more fresh water in the tank. 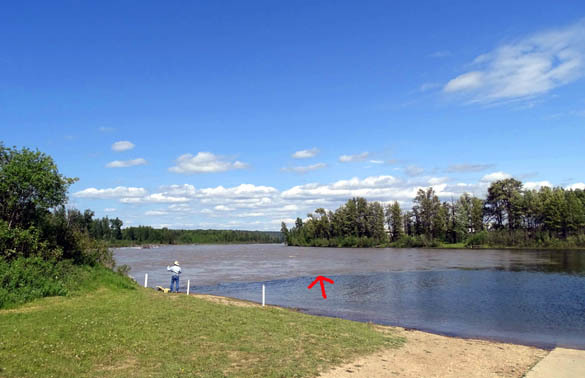 There are only a couple campgrounds listed for Whitecourt. 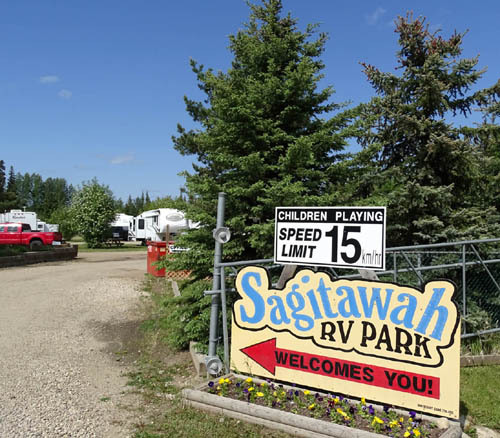 I called the Sagitawah RV Park about an hour before our arrival to see if they had an available site for us. They said yes, we'll save it for you (without a formal reservation). We said we'd be there soon. The campground is not visible from the highway so we had to drive back a little paved road to the entrance before we knew if it'd be nice. Although we didn't really love this RV park it was a good thing we didn't go to Walmart. It was our best choice in Whitecourt. You can't see Walmart from the main highway. Jim rode by it on his bike later and discovered that there isn't room in the parking lot now for an RV our size. The store is being remodeled into a super-Walmart and the parking lot is a mess. We've seen that at other Walmarts up here and around the U.S. as they super-size old stores. We really didn't consider the only other campground in town. 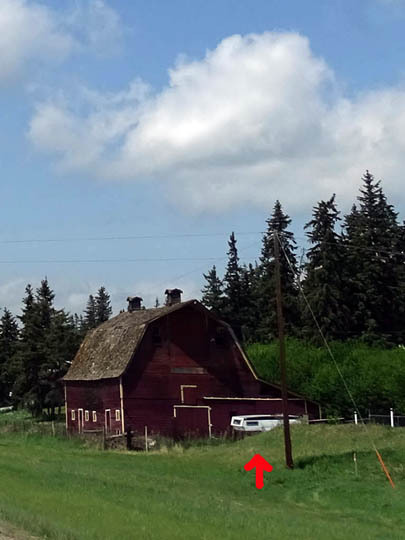 Jim wasn't impressed with it when he drove by three years ago and one of our neighbors at Sagitawah said none of the oil, gas, or lumber workers want to stay there because the manager is "difficult" (that's not exactly the term he used). 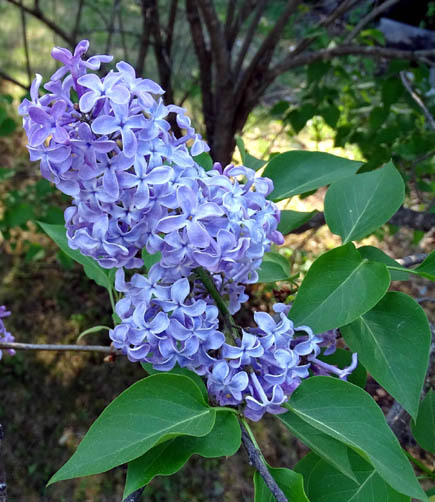 The RV park has several large lilac "trees" blooming in different colors near the office. 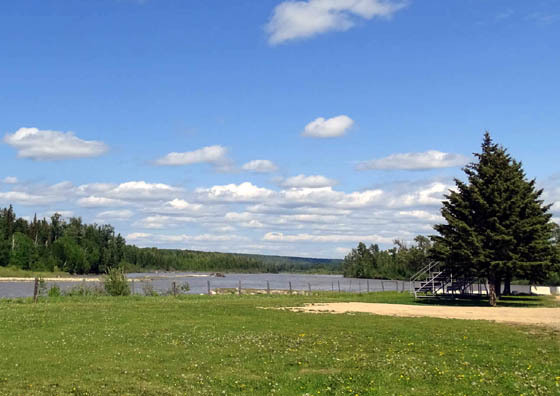 We got one of the few remaining sites at Sagitawah, not because of all the Alaska-bound travelers but because of all the seasonal or year-long workers living there! This is like a well-groomed "man camp." 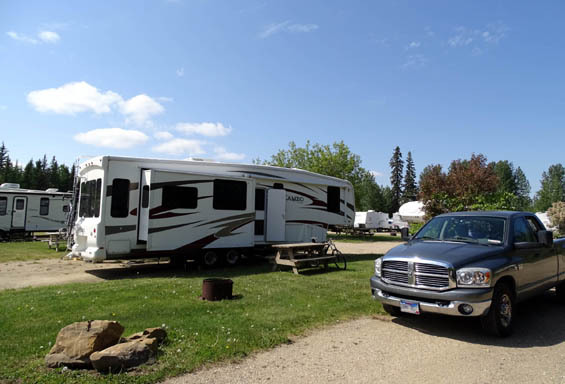 Most of the RVs are nice but the sites look more lived in than in an RV park where turnover is high with travelers. I'm not sure if anyone else is here just for the night or not. We're the anomaly, and that made us feel a little uncomfortable. We were happy to see that one of the workers is living in a good-looking Cameo similar to ours. We didn't see him outside so didn't talk to him. We've found narrow sites to be common at private campgrounds in Canada (often in the U.S., too). We just kept our blinds closed on the utility side. We don't have very many windows on that side anyway. 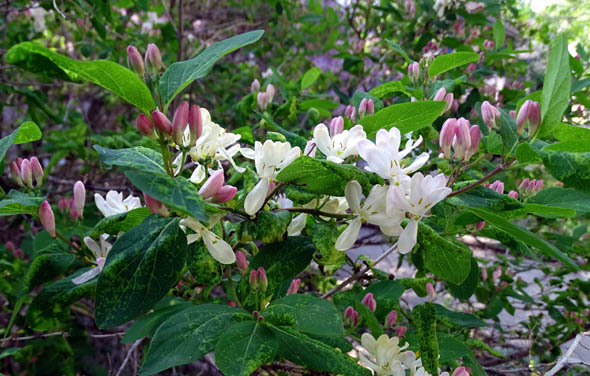 There are also back-in sites in the trees around the perimeter of the campground, plus tent sites. All but the tent sites were mostly full. We have 30-amp electricity, water, and a shared sewer. We have WiFi but I couldn't access it on my laptop in the evening because everyone else was on it, too. Jim got on OK with his laptop. The cost was $37.25 CA, or about 80% of that in U.S. dollars. We had lots of time before dark to get some exercise and relax. After we got set up Jim put his bike in the truck and went into town to ride and get fuel. He cycled about twelve miles solo, then took Casey a couple more miles near the campground with the Walky Dog attachment. While he was gone I walked the dogs separately for two miles each down the little road past our campground . . .
That's where the fishermen like to cast their rods. When I walked Casey to the park only one older man was there, fishing. When I took Cody to the park closer to suppertime there were about 10 vehicles, with more people fishing, picnicking, and playing ball in one of the nearby fields. I thought the rivers looked so interesting that I took Jim back after supper to see them. As we drive farther north the terrain is more mountainous -- and interesting! 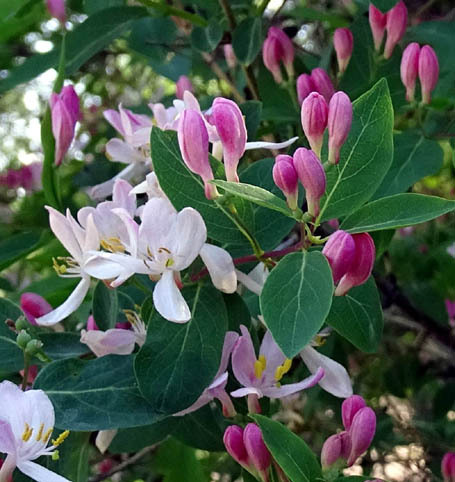 We will start leaving earlier in the morning and stopping earlier in the afternoon than we usually do when traveling in the Lower 48 so we can have more time to hike, bike, and relax at the campgrounds where we stay overnight. We don't plan to repeat all of the sight-seeing we did in 2012, such as watching the movie in Dawson Creek about the construction of the Alaska Highway in 1942. Been there, done that. We want to do some different activities this time and maybe stay at some different towns and campgrounds like we're doing tonight. Each evening I study my journal from 2012 to see what's coming up the next day as we head to Alaska. Tomorrow will combine all of the third day and parts of the fourth from our first Alaska trip. We have a few days we could kill along the Alaska Hwy. this year but we hesitate to use any of them this far east, in case we run into another delay like the unprecedented road washout where we got stuck in Watson Lake for five days. We couldn't have asked for better driving weather today. More of this trip is planned than three years ago because we better know where we want to go and how long to stay in each place. 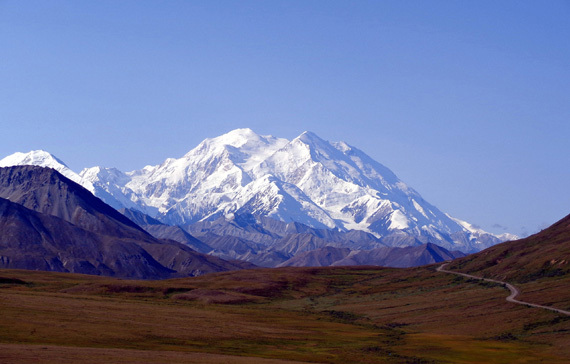 We also know more visitors are going to Alaska this year so we are making more reservations than previously. That said, we don't have a reservation for tomorrow night. We aren't sure if we'll stop in Grande Prairie, AB for a couple hours to cycle on the nice bike path we enjoyed in 2012. If we do, we'll likely stop at Dawson Creek, BC, the beginning of the Alaska Hwy. If we don't stop in Grande Prairie, we'll probably continue a little farther to Fort St. John. We haven't stayed there before but I remember seeing a good-looking RV park at Charlie Lake . 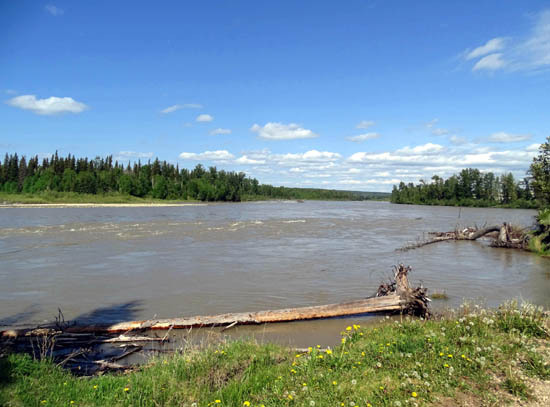 . .
Next entry: Whitecourt, AB to ?? ?